Houthi rebels agree to five-day humanitarian ceasefire proposed by Saudi Arabia, warn they will respond to any violations. The Houthi rebels in Yemen on Sunday accepted a five-day humanitarian ceasefire proposed by Saudi Arabia, but said it would respond to any violations of the pause, Reuters reported. Neighboring Saudi Arabia had said on Friday that the ceasefire could begin on Tuesday if the Iranian-backed militia agreed to the pause, which would let in badly needed food and medical supplies. Backed by the United States, a Saudi-led coalition has been conducting airstrikes against the Houthis and army units loyal to ex-president Ali Abdullah Saleh since March 26, with the aim of restoring the government of President Abd-Rabbu Mansour Hadi, who was forced to flee Yemen in late March when the Houthis began marching on Aden. "We will deal positively with any efforts, calls or serious and positive measures that would help lift the suffering and allow aid, supplies and ships to move safely to Yemen," the Houthis said in a statement carried by state media Saba and quoted by Reuters. 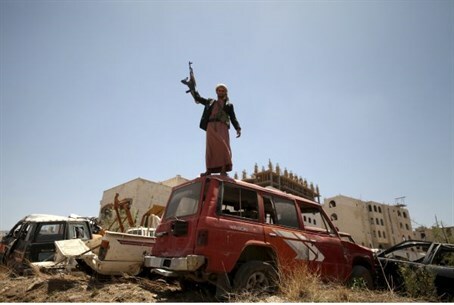 Colonel Sharaf Luqman, spokesperson for the Houthi-allied army, said on Sunday Yemeni forces had agreed to the truce but would confront any attacks by Hadi loyalists on battlefronts which stretch across much of the impoverished country. The Houthis say their campaign is aimed at defeating Al-Qaeda terrorists based in Yemen and accuse Hadi's forces of supporting the group. The Houthi agreement to the ceasefire came hours after a spokesman for the Saudi-led coalition said the Houthis had “changed the equation” by targeting Saudi cities in recent days, and vowed that the coalition would go after leaders of the rebel group.